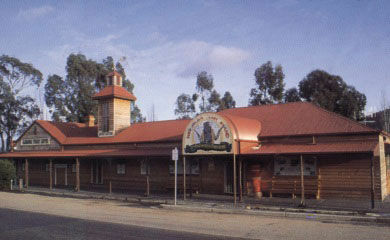 Bob Hempel has been operating the Glenrowan Tourist Centre for nearly forty years and is a great source of information about the Kelly Gang and Glenrowan. 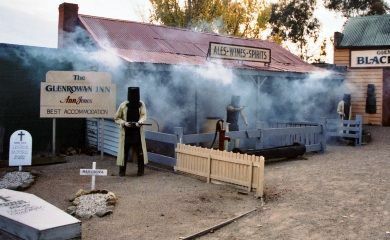 The museum and show set the scene for the happenings of 28 June 1880 when the infamous bushranger Ned Kelly and his gang staged a gunflight and fire at the Glenrowan Inn. 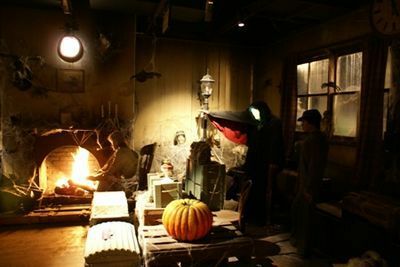 The show is not a picture theatre but rather an interactive production with a range of animatronic characters who lead you through that fateful day in a forty minute show. 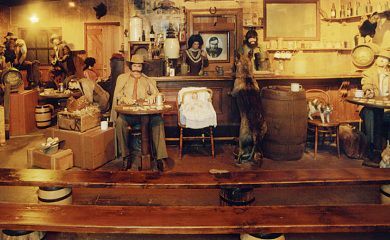 Through the brilliance of animation and computerized robots, you will be transferred back in time, over 100 years, to witness the events that led up to the capture of the Kelly Gang. The story starts from June 27, 1880 with the police members' train ride from Melbourne, then moves to the hostages in the Hotel, and then onto gunfights - burning buildings - a decent hanging, and finishing in our magnificent painting gallery. The show is educational, historically correct and entertaining. Runs for 40 minutes every half hour (separate rooms) from 10:00am to 4.30pm daily.